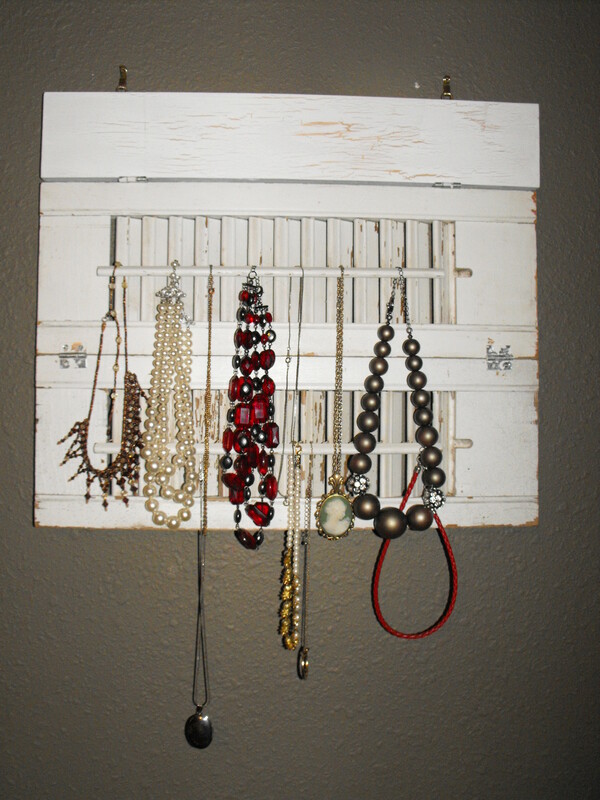 So my dear friend Megan bought some old window shutters and gave them to me to do something cool with them. Well they sat around my studio for a couple of years while I awaited inspiration. I tried them with so many different things, but ended up not using them, keeping them back for something special. So the other day I was staring at wall in my dinning that I have never done anything with. It is kinda a hall way space and I have only ever hung a calendar there and a plate rack. Feeling the creativity bug coming on I decided what I needed was an organization station on this was. You know, a place to hang keys, notes, pictures, invitations to up coming events… I found all kinds of things around that I already had but just needed to be painted to match better. My husband and I really like the French country look, so that is the direction I took. Them Like a Light bulb turning on, the idea of the shutters came to me. I ran and got them and held them up to the wall this way and that trying to figure out if I should just hang them as decoration or if they should have a purpose. As I held them there up and down as they are always used, I could think of nothing but using them as wall decoration. But then I turned them on their side. All the sudden it was something to hang things on. 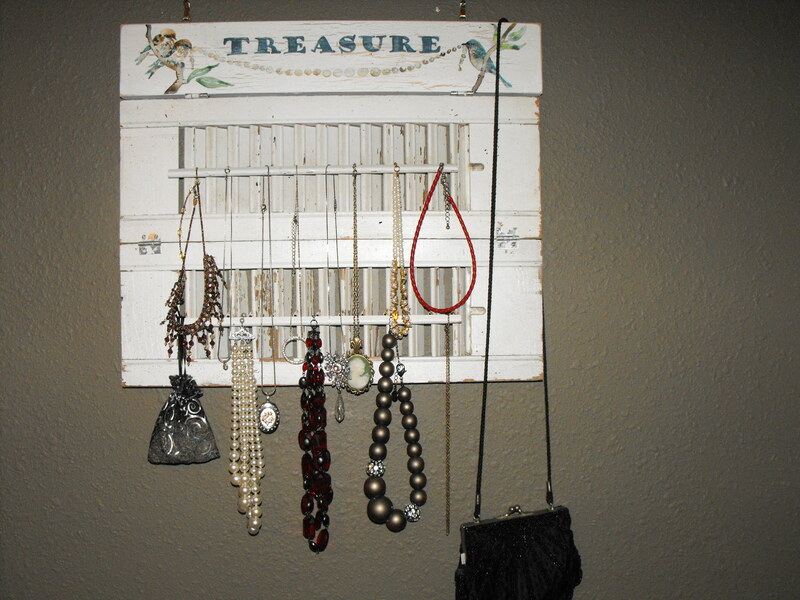 I started thinking about Keys and such because that is where my mind was, but then I remembered that my daughter had just made the coolest necklace holder out of an old picture frame, which she added a piece of cut metal grating from a screen door base. It was so simple but so elegant. I immediately went to my room and started to hang necklaces on the little bar that connects all the little louvers. It worked like a dream. I had to move the hinges to the front of the shutters so it would hang flat against the all. Then I simply cut a 1×4 for a header piece, I painted the board with a crackle finish to the unfinished board, then painting over top with a white paint as instructed on the bottle.Then using the hinges that were already on the shutters, attached them to the header. Once this was all completed it was a simple matter of deciding what to paint at the top. This idea came from My niece and I thought it was awesome! Thanks Beth. I water-color painted the birds and pearls, and used acrylic for the script. 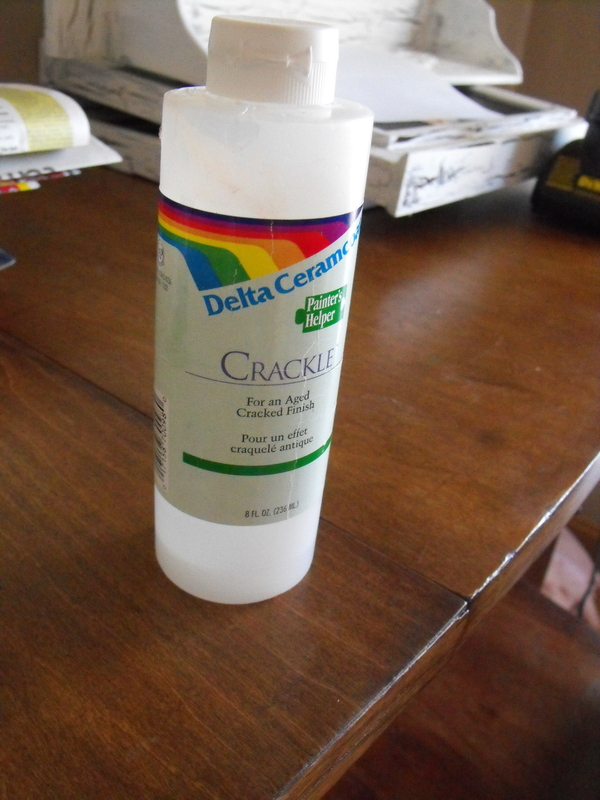 Then I give it a quick top coat of clear spray paint to seal the watercolor from wiping off or getting smeared. Couldn’t wait for it to dry to get this project out to you. I was too excited. Find my work on these fine sites…Happy Shopping!